After a gap of three years, this game is the continuation of the Donkey Kong Country series and it also presents, for the first time, the world of Donkey Kong in full 3D. This time, as well as stealing all of Donkey Kong’s bananas, King K. Rool has kidnapped his friends, Diddy, Lanky, Tiny and Chunky and is charging up a giant laser so that he can completely destroy Donkey Kong Island. So Donkey Kong has to rescue his friends, recollect his bananas AND save his home! 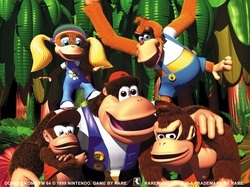 The main story mode sees Donkey Kong going through eight large worlds in order to achieve his tasks. There’s a large variety of locations, ranging from a jungle to a creepy old toy factory and exploration is a big part of what makes this game so fun. You start with access to only one world and in there you’ll complete various tasks in order to collect golden bananas which you need because each new world has a golden banana toll before you can enter. Every world also has its own boss (which can only be accessed after collecting a certain amount of regular bananas) and when you defeat a boss you’ll be rewarded with a key which will slightly change the hub world (Donkey Kong Island) in a way that will open up more areas to reach. What I also quite like, is that every time you rescue one of the other Kongs they then become a playable character. Every character has their own weapon to get, as well as their own instrument and their own unique abilities and they all have to be used in order to do everything. I especially liked the strong one in the group, Chunky, and also the strange one, Lanky (who can inflate himself, just like a balloon) but Tiny always seemed a little bit of a disappointment since she’s so similar to Dixie from the previous games (who I preferred) that I wondered why she wasn’t in it. The game also has a multiplayer mode where up to four players choose a Kong and simply fight one another. There isn’t particularly that much to this mode, there’re a few different levels to play and one or two different modes and that’s about it, but it’s fun enough if you want to play with more than one person. There’s also a single unlockable character for multiplayer only, but I shan’t spoil it. There’re many other things ‘on the side’ of the main game too. As part of the story you unlock complete versions of the original Donkey Kong and also Rare’s old game Jetpac which are both very nice additions. Also, while they are both quite sadly underused, Animal Buddies Rambi and Enguarde both return and they each have their own mini games too, which can be replayed again and again in order to beat high scores.